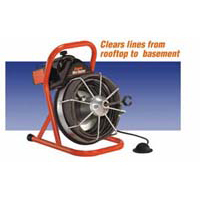 The Mini-Rooter Pro clears drains from rooftop to basement, including kitchen, bath, and laundry drains. And it’s portable too: Built-in wheels make it easier for you to transport the Pro to and from the job, and the folding handle allows for compact storage in your truck. This inexpensive, light weight machine has lots of time-saving features. For instance, you can remove the drum in seconds for more portability or to switch to a different diameter cable – with no mess and no lost time. A distributor tube inside the drum allows you to feed cable in and out without chucking and releasing the cable every few feet – so you finish quicker. An optional Power Cable Feed drives and retracts the cable at up to 16 feet per minute. The drum carries up to 75 ft of 3/8” cable to clear 2” to 3” lines, or 1/2” cable for heavier work in 4” lines. For small drain work, you can order your Mini-Rooter Pro with a J-Drum for handling smaller, more flexible cables. Some Mini-Rooter Pro safety features: A foot pedal that uses air pressure to start and stop the machines, with no electrical wiring between the pedal and motor, a ground fault circuit interrupter, and a high impact plastic guard covering the motor pulley.